Union Hill community members turn their backs on the Virginia Air Pollution Control Board January 8, 2019. Photo courtesy of Laura Saunders. A decision has finally been made on the air permit for the Buckingham compressor station after months of delays, Governor Northam’s removal of two board members, and an additional comment period scheduled smackdab over the holidays for the public to respond to new information about the project. But all during that time, public demand to stop the compressor station and protect the historic, African-American community of Union Hill deepened here in Virginia, and spread far across the country. More than 6,000 people signed a Change.org petition calling on the air board to deny the air permit for the project, which is part of the unneeded proposed Atlantic Coast Pipeline. Environmental justice leaders and well-known climate champions (Danny Glover, Karenna Gore, Don Cheadle and Alyssa Milano are a few) signed on to a letter highlighting the injustices of the proposed project. Large news outlets were increasingly reporting the story and former air board members were weighing in as well. By the time January 8 rolled around, all eyes were on the Virginia Department of Environmental Quality (DEQ), the Air Pollution Control Board, and the rural, quiet community of Union Hill. State police remove a pipeline resister from the Virginia Air Pollution Control Board January 8, 2019. Photo courtesy of Laura Saunders. 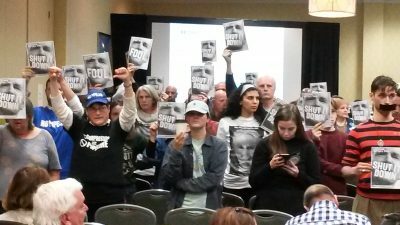 Despite short notice for the meeting, the large hotel conference room in Richmond was nearly full with attendees from the Union Hill community, other Buckingham County, Va. residents, Dominion Energy staff (the monopoly utility applying for the permit), and Atlantic Coast Pipeline resisters from around the state, including kids and infants. There were also numerous state police — dozens — as has been the case at any Virginia citizen board meeting about the pipelines for the last several years. To say that the room was charged with emotion is an understatement. It wasn’t hard to tell that the air board wanted to get the decision over with as soon as possible. After the usual introduction about the permit from DEQ Air Division Director, Michael Dowd, the board chairman told the watching crowd that no interruptions would be tolerated and if the public “spoke out of turn,” they’d be removed from the room immediately. This warning didn’t stop people from speaking out and responding to Dowd and board members when they made dishonest and insensitive comments, however. The crowd relentlessly reminded the board of how important its decision was for the future well-being of the Union Hill community, and for all of us. By the end, police had removed 10 people who had shouted out during the meeting with pleas, anger or reminders of the board’s role in a democratic process. When one of the air board members made the motion to accept the draft permit, a huge outcry erupted from the crowd. The motion was seconded, and the board’s “discussion” began. I say so sarcastically because it wasn’t much of a discussion at all. Three of the four board members took turns reading off their ready-made, faulty reasoning explaining their ultimate support for permit approval. One particularly outrageous monologue for the permit came from board member William Ferguson, who didn’t say a word about the compressor station or the technical applications of the air permit, nor about site suitability or environmental justice. Instead, he spent his time explaining why he approved of the Atlantic Coast Pipeline and wanted fracked gas for his community, Hampton Roads, Va. Such monologues explained our frustrations — we weren’t being heard. After about an hour-and-a-half, on a roll call vote, all four members present voted for the air permit. (Two new members were not present, and the board’s seventh member has recused himself from all deliberations about the compressor station permit.) Within minutes, with more than 100 of us in stunned disbelief and distress, the state police began shuttling us out of the building. But this unjust approval of the air permit does not mean that the compressor station — or the Atlantic Coast Pipeline — is a done deal. At this moment, the Buckingham community continues to fight the compressor station. Construction has not started at the proposed site, and Dominion is missing seven permits for other aspects of the project, halting construction of almost all parts of the pipeline. These are all important federal permits that impact construction along the entire 600-mile route, including all waterbody crossings, the Appalachian Trail and Blue Ridge Parkway, among other important locations. And if these issues, among a number of additional pieces of litigation against the pipeline, aren’t resolved soon, Dominion will have to wait to start construction until this fall because of restrictions on potential impacts to bat habitat in our region. It’s predicted that these delays will raise the cost of the project another billion dollars — making it a roughly $7 billion project. Meanwhile, the cause of the Union Hill community continues to gain attention nationwide. Follow the story on Twitter and Facebook using #WeAreAllUnionHill and #noACP. And stay tuned for more updates here on the Front Porch!